The 39 Steps is the Olivier award winning comedy play at the Criterion Theatre, which is in the middle of Piccadilly Circus in the West End of London. The play is now in its eighth year at the Criterion and has had success all around the world winning Tony awards and Drama Desk Awards and you can see why when you see the play. 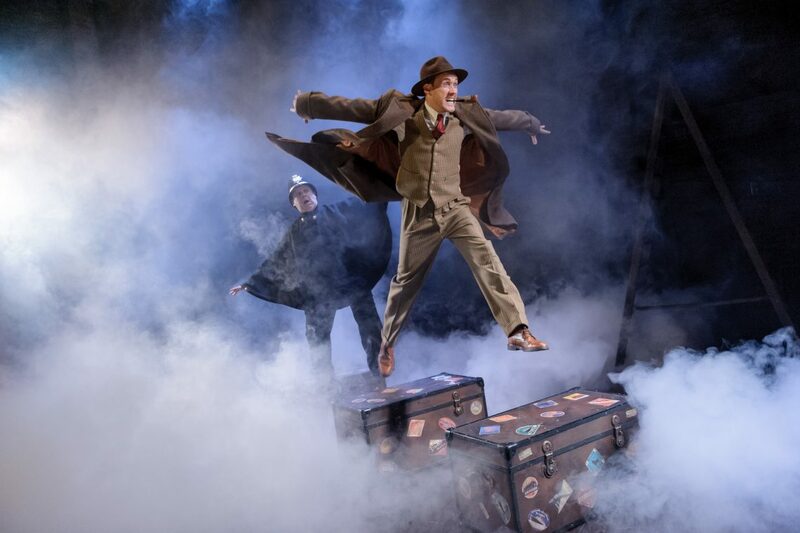 Patrick Barlow (actor, comedian and playwright) re-worked the classic tale for this play and has created a fast moving play which has slapstick comedy and a thrilling tale of a man on the run and answers the question “What is The 39 Steps? !” Patrick Barlow and the team are geniuses for turning this tale into a comedy and getting it on the West End, the shows long running period on the West End and awards all go to show what a great production they created. The 39 Steps, if you did not know, is originally a novel by John Buchanan and was most famously directed by Alfred Hitchcock in the classic 1935 film that brought female characters into the tale as the original novel features no ladies. This play, which is directed by Maria Aitken, while based on the same film (rather than the book), is an altogether different experience, a hysterical comedy version of the original thriller. The script is full of allusions to (and puns on the titles of) other Alfred Hitchcock films, including Strangers On A Train, Rear Window, Psycho, Vertigo and North by Northwest. Whether you are a fan of the original film or the book you will find this play an excellent alternative to the usual London West End theatre experience. The play starts with the 37 year old hero, Richard Hannay (Ben Righton) feeling bored and looking for something exciting to do. 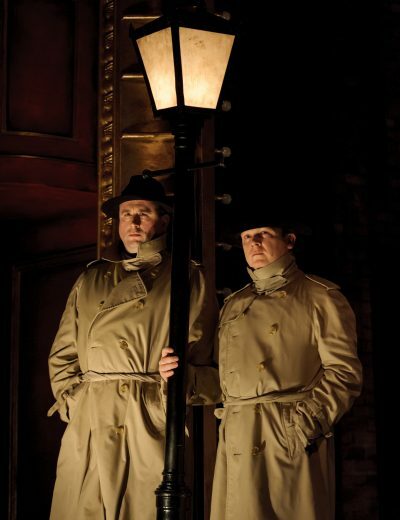 Hannay goes to the theatre where he meets a mysterious young lady, Annabella Schmidt played by Ellie Beaven (who plays two other women in the play) and to cut a hysterical story short, she gets murdered in his flat after revealing some secret information about “The 39 Steps” and the chase begins for Hannay. 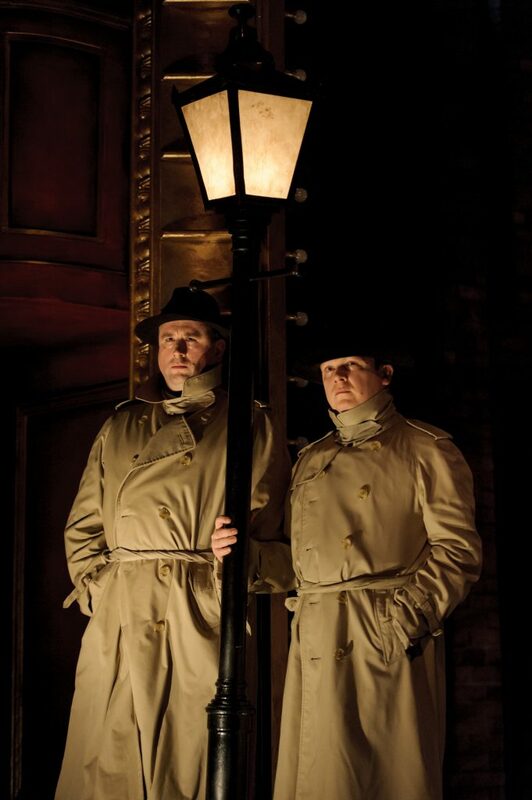 Along the way Hannay is accused of murder and comes across the answer to the question of “What is the 39 steps?”. 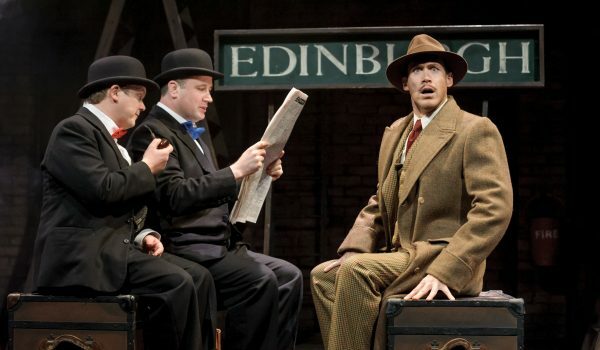 Most other roles (130 in total) are played by just two male actors: Greg Haiste and Nick Holder, sometimes several at a time with just a quick change of hat and accent to alert you to the identity. Python-esque characters and outrageous overacting will keep you laughing to the end. 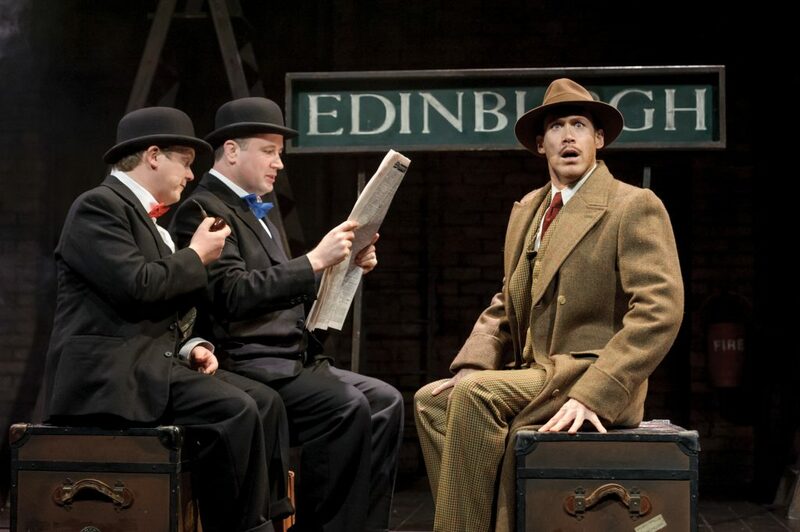 With only four actors the show is a hoot and Ellie, Greg and Nick are superb at playing the various roles in the show and Ben is delightfully British as the hero of the story (and rather dashingly handsome with his moustache!) All actors work their socks off and play their roles brilliantly. I suggest you go and see this wonderfully funny play as you will not be disappointed with a laugh-tastic night out at the theatre with some great acting, intelligently imaginative sets and superb humour. Tickets are avalibale at the Theatre’s Box Office or online.